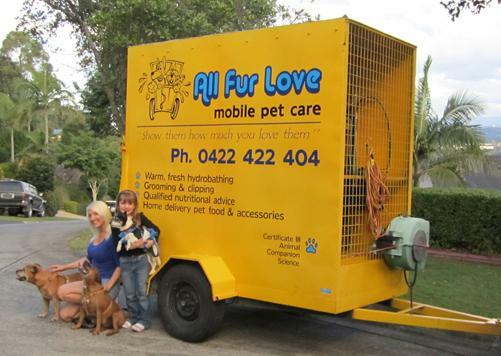 We are a small family owned business based in Brisbane, customer service is our specialty - we don't leave untill you're happy! We custom make our own shampoo and conditioners to suit every pet's skin type. We also use a number of highly recommended vet products - whatever the skin type, breed or size we have you covered! We use fresh warm water for every bath with your choice of shampoo and conditioner, we also diagnose the skin and recommend a shampoo and conditioner to suit. We use a blow dryer to dry off all our dogs we believe this helps to eliminate dead hair by blasting it away, for an extra charge we can do a full blow dry. All dogs and cats are brushed knot free before bathing. With every service we trim the nails FREE for all dogs and cats. We use only the very best product recommended by vets for our worming and flea control, We keep a record of when your dog or cat is due if you’re on our regulars list and remind you, There no need to remember when your dog or cat is due for worming or flea control anymore let us take care of that for you at no extra charge. For those sensitive dogs or cats we have a large range of shampoos and conditioners to meet there needs if this is a concern please ask us, we are more than happy to take the time to go through our products. We also use a number of vet line treatments to treat skin conditions. We can help you decide what brand of pet food is best for your cat or dog with our qualified advice, we offer free delivery with every service. We custom make and sell our own shampoos and conditioners which are soap free for those sensitive skins, our shampoos are a salon quality product leaving your pets coat shinny and smelling great! We offer a beautiful custom conditioner to bring the shine out in your cat or dogs coat leaving them feeling silky soft. We have a wide range off pet food and accessories available you name it well order it. Our regulars receive bonuses for being a loyal customer each week ask us more about this.